A host of big names will descend on Thorp Arch & Boston Spa Cricket Club this weekend to contest an exhibition match in front of a sell-out crowd. Thorp Arch resident and Yorkshire CCC fast bowler Ryan Sidebottom has invited a team of celebrities and professional cricketers to tackle his local club side as part of his testimonial year celebrations. 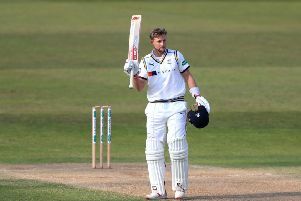 Thus, a star-studded line-up comprising former England ODI and T20 captain Paul Collingwood, current England Test batsman Gary Ballance and several other Yorkshire first-teamers will take to the York Senior League outfit’s pitch on Saturday afternoon. In addition, TV’s Love Island’s Chris Hughes, BBC Look North presenter Harry Gration and Coronation Street actor Colson Smith are also set to feature. “The game can’t come quick enough, I’m really looking forward to what should be a great day,” said Sidebottom who will retire from professional cricket at the end of the season. “I’m delighted that the likes of Paul Collingwood, who was my captain when we won the T20 World Cup for England, and Chris Hughes from Love Island are coming along as well as a lot of my teammates from Yorkshire. We’ve got a really good mix of blokes who play and love cricket. “Their support means a lot to me, and attracting these guys has helped generate a lot of interest in the fixture. A total of 950 tickets have been sold for Saturday’s T20 clash and proceeds from the fixture will be split equally between Sidebottom’s testimonial fund and TABS. A collection will also be taking place for Martin House Children’s Hospice, for whom Sidebottom is an ambassador. “The money we raise should help TABS, who are a fantastic community club with lots of juniors make improvements to their ground and facilties,” Sidebottom added. “This will hopefully benefit all the youngsters that they have coming through here. I believe that it is important to give something back to the sport and I’m pleased to be able to do so. “We will also be collecting throughout the day for Martin House, which is a great cause and I am really hopeful that we can raise a decent amount of money for them. Gates open at 1.30pm, with the cricket scheduled to get underway at 2.30pm. The game is a sell-out and admission will not be possible without a ticket. Ryan Sidebottom’s Celebrity XI: Ryan Sidebottom, Paul Collingwood (Durham CCC), Harry Gration (BBC Look North), Chris Hughes (Love Island), Colson Smith (Coronation Street), Gary Ballance, Jack Leaning, Adam Lyth, Liam Plunkett, Ben Coad, Andrew Hodd, Steve Patterson, Jack Brooks (all Yorkshire CCC).